A total of 10 Junior Muaythai Kickboxers of Academy of Martial Science, representing Mysore Muaythai Trust, won five Gold, three Silver and two Bronze medals for Karnataka at the19th Junior and Sub-Junior Muaythai National Championships held at Shakti Hill Resorts in Bengaluru between July 19 and 22. The Championship saw more than 150 children from various States of India participating. The event was organised by Muaythai Association of Karnataka, under the aegis of Muaythai India, MTI. The fighters are trained in Muaythai by Kru. Vikram and team at AMS. 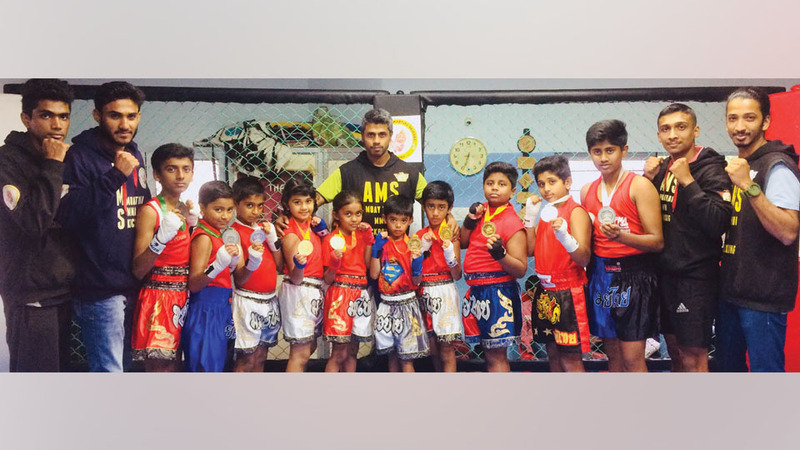 From 18 kgs-55 kgs (7 to 14 years) — Ankush P. Mathad – Gold Medal (Youngest Muaythai Champion); G.M. Durgashree – Gold; Theeksha Bharuni – Gold; K.K. Kushik – Gold; Dattatreya – Gold; S.R. Nivedh – Silver; Taran Ponnappa – Silver; Samarth Vikram – Silver; Aryan Raj – Bronze; S. Hithesh – Bronze.